I may be able to help you here. I have a 73 H code vert but not nearly as well optioned as yours. I also have my build sheet in decent condition. See below. Hopefully it will help with some of what you are looking for. (07-14-2017, 12:02 AM)BeerDontCount Wrote: I may be able to help you here. I have a 73 H code vert but not nearly as well optioned as yours. I also have my build sheet in decent condition. See below. Hopefully it will help with some of what you are looking for. Hey Scott, Thank you! 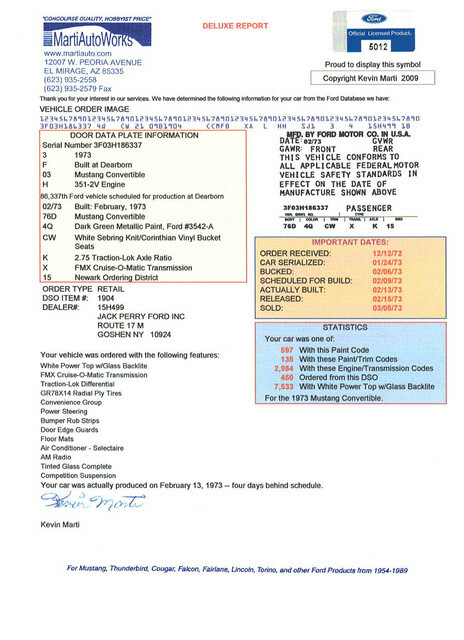 Could you tell me a bit more about your car to help me understand what I am looking at in your build sheet? For example, do you have an FMX trans, factory gauges, console, what axle ratio? Looks like you have an Ivy Green car, do you have black interior with a white roof? What is your alternator.... i.e 55 or 61 amps. I believe 61 amps was common for A/C cars. Looks like you have standard rims with dog dish caps and radials... correct? Looks like you have competition suspension and variable rate steering..correct? I don't, which would explain the different values for steering, shocks, and suspension. I have a lot of questions and I appreciate your help. Hi Rich. Here's my Marti report. It should give you all the info you are looking for from my build sheet. Let me know if there's anything else you need. I have completed my first pass at reproducing my buildsheet. My original one had very little that was still readable, so by comparing other buildsheets for cars similar to mine, I think I have a good facsimile of what mine looked like. Being a bit of a computer geek, I created my own window truetype font to match what was used on the buildsheet including the slashed zero and the other nuances in the various letters and numbers. 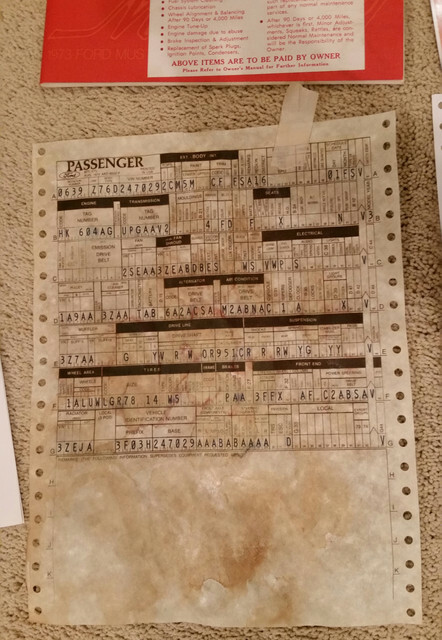 I then scanned a blank repro buildsheet as a template and create a MS Word document as an overlay to the scanned image/template and then type the numbers and letters in their respective boxes and lines. I just type and print it on my HP color inkjet printer. Final steps are hole punch the tractor feed holes, seal the inkjet ink, then stain the hell out it and let it dry. 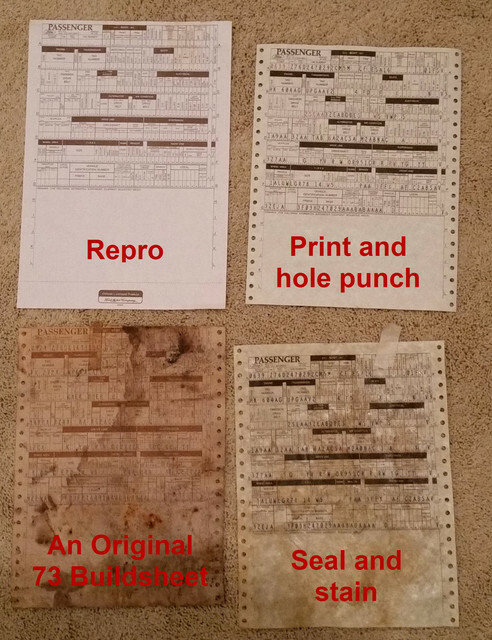 The picture below shows the blank sheet, the printed and hole punched, and stained. The lower left is an original 73 buildsheet for comparison. Wow thats pretty good! Nicely done. Thanks. I appreciate the feedback. 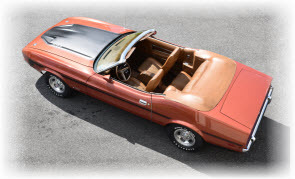 Always like to read about how others have found ways to creatively research and preserve their car's history, as well as, reproduce or restore its documentation. For me, researching and learning about a car's history is as interesting as the restoration itself. Great work by all who continue to contribute! Hopefully, this work to decipher the build sheets will keep making progress for all years. 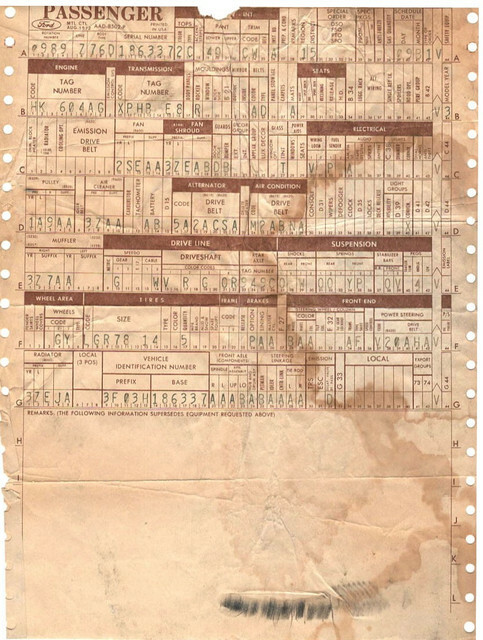 "VEHICLE ORDER IMAGE". Does this data correlated directly to the info on the build sheets???? Ray, that's a good question. Best I can tell some of the punch card values are an exact translation, while other values are abreviated or reduced to a single punch card position. Remember in the old mainframe computer days storage was expensive so values were reduced (compressed) as much as possible to conserve computing space.